Thurne is a small parish in east Norfolk, and the River Thurne marks the western boundary of the parish. The small village of Thurne is in the west, and other houses and farms in the north are strung out along the edge of an area of former fen, as shown on Faden’s map of 1797. A ring ditch (NHER 18335), probably the remains of a Bronze Age round barrow, is visible as a cropmark on aerial photographs. So far, no finds from the prehistoric, Iron Age or Roman periods have been recorded in the parish. Thurne comes from the Old English meaning ‘thorn bush’. Thurne is mentioned in the Domesday Book when the land was held by St Benet’s Abbey. Six smallholders and ten free men are listed for Thurne, which was worth twenty shillings. No Saxon finds have yet been recorded. St Edmund's Church (NHER 8553) dates back to the 13th century, and has a 14th century nave and tower, and 15th century windows. In the mid 17th century Sir Thomas Browne noted that a man named Richard Ferrer was buried here in an ox hide and horns to try and confuse future historians and archaeologists! Thurne Broad (NHER 13514) was a medieval peat cutting that became flooded in the late medieval and early post medieval periods. The Broad is shown on Faden’s map of 1797 to the north of the village, but has since been filled in. Metal detecting has recovered a medieval lead ampulla (NHER 35034) and post medieval tokens (NHER 35034, 39919). A fragment of an 18th century jar (NHER 17558) has also been found. The Manor House (NHER 8541) is a late 17th century brick house with extensive 20th century alterations. The Thatched House (NHER 42907) is an early 18th century house that was originally divided into three houses. 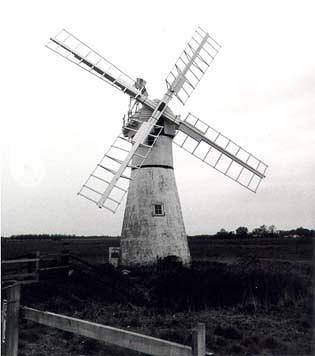 Thurne Dyke Windpump (NHER 8554) was built in the 1820s and was restored in the mid 20th century. Sarah Spooner (NLA), 8 February 2006.